which our team is introducing higher amounts of value and precision to the products our customers bring to market. In some cases, the completion of a new design effort can inspire the recognition of additional ways in which to expand added levels of improvement or enhancement for a product. A good example of this is visible within a recent design effort involving a Milwaukee Electronics customer who manufactures printers. Initially, the customer asked us to create a customized test system that would enable the observation of ink droplets ejecting from ink cartridges in real-time. Their product development team needed a way to precisely position ink cartridges, high speed video cameras, and lighting in order to make minute examinations of the printer head and ink nozzle activities. Once our design team had developed and delivered the new system for the equipment, one of the customer’s engineers realized there was potential for an additional improvement. Although the engineer didn’t know exactly how it should look, his assertion was that adding a custom designed mechanical adapter fixture would enable a faster changing of printer cartridges. This hypothesis centered around his goal of helping to reduce setup time and allow for faster measurements on an expanded variety of products. To get the ball rolling in creating a specification for the fixture, the customer’s team provided our Design Engineering Group with several key elements to begin fabrication. Firstly, the detailed description of exactly how and where each mechanical piece needed to be physically positioned within their equipment was given. Second, our team needed 3D models of all units under test (UUTs) to begin the process of designing and creating a prototype – these were also provided by the customer. Before fabricating a prototype, our design team worked closely with their engineers to iron out some of the finer details and suggested some UUT model parameter adjustments for proper functionality. The customer was then presented with a 3D model of the proposed fixture for internal QA review. Once the design was approved, Milwaukee Electronics used our in-house 3D printer to fabricate and deliver a rapid prototype unit for a fit check. After initial customer evaluation, it was discovered that this fixture adapter design inadvertently blocked some of the light which reflected off of the UUT – and this light was necessary for correctly capturing the desired imagery. To fix this issue, slight changes to the design were then made, and the final design was approved. 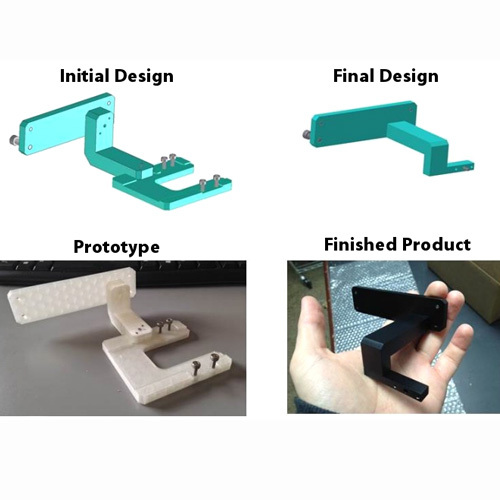 To complete the endeavor, the Design Engineering Group subsequently fabricated a number of the customized adapter fixtures and shipped them to the customer for implementation. “Any unique design project will inherently contain hidden challenges, and this case provided a classic example of just that. Often times, with many product development teams, the finer details and intricacies of a design will be less obvious than choosing the basic functions of the finished product. Apart from their larger proficiencies within PCB design for manufacturing, industrial controls, and electronics design fields – the Milwaukee Electronics Design Engineering Group has a strong ability to help our customers fine-tune these smaller details. 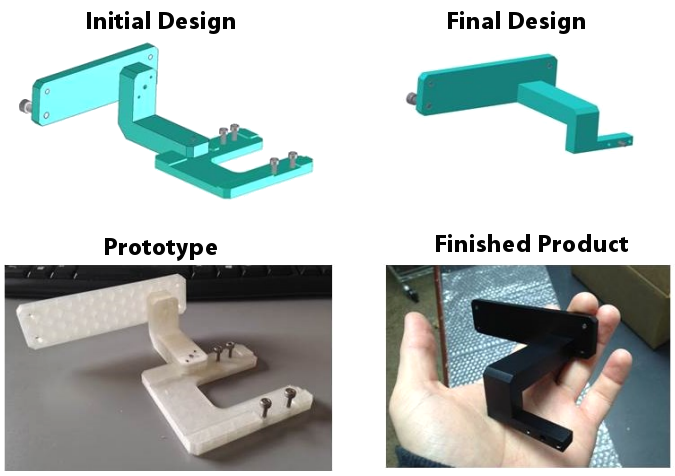 Our team can quickly provide samples or even small runs of fixtures and/or parts by utilizing powerful tools such as a 3D printer,” said Brandon Loo, the Design Engineering Group’s Director of Engineering. Examples such as this one clearly illustrate that Milwaukee Electronics plans to continue this trend of solving customer challenges and inspiring ever-greater improvements to quality, functionality, and performance for our customer base.